What makes the best banana bread recipe? Honestly, have you ever eaten any which you did not like? Not me! 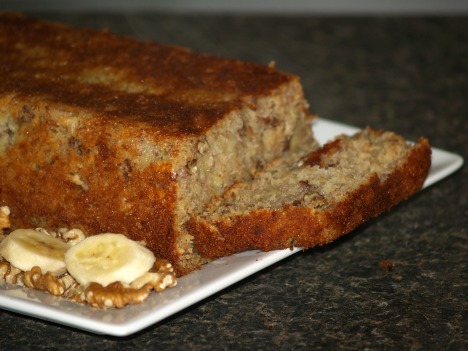 Since banana is the favorite flavor of the quick bread recipes, I decided to find which is my favorite recipe. I spent two days baking to search for the best banana bread recipe. I wanted to make all my selections at the same time so I could taste them and compare the flavors. My selection of recipes was done according to the ingredients which they contained and in some instances the amount of the ingredients. As you might already know, I love and favor ingredients like sour cream and buttermilk. Various shortenings also make a difference in flavor and texture and the amount of shortening and flour will influence the outcome of the product. The lightness of baked goods depends much on the leavening used and how much is used. Some recipes have baking powder, baking soda or both. Of course, in these recipes, the amount of bananas added will determine the banana flavor and the moistness. For these reasons, I have chosen to make recipes containing this variety of ingredients. Black walnut banana bread has always been one of my favorites because I love black walnuts. This, however, is not the reason for choosing this recipe. This one is quite a “basic recipe” but contains a little less flour than my other choices. This usually contributes to the moistness of the bread. This is also made with a solid shortening and I usually prefer the butter flavor in my baking. I chose the banana loaf recipe for a couple of reasons. It contains two cups of flour (per loaf) like most of the banana breads. It also has dates and oats in it which I like for adding flavor and texture to baked goods. This one also is made with solid shortening but is different because it is the only one made with brown sugar. I love the combination of banana and blueberries so I chose to make banana blueberry recipe . This recipe is made with butter as the shortening which I usually prefer for the flavor and texture. I also like the added flavor from the allspice. 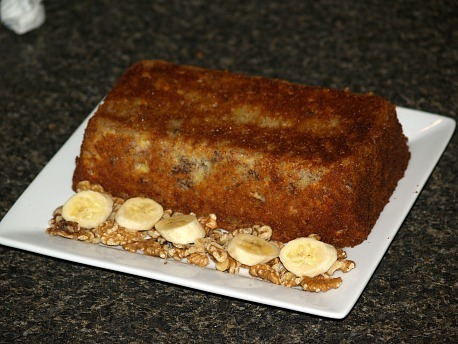 In searching for my best banana bread recipe, I chose to make banana All Bran recipe with All Bran Cereal. Although it has less shortening and less sugar than many other recipes, it always turns out moist and delicious. But, will it be the best? It was not hard to select the sour cream banana bread recipe to try. This has always been a favorite because I love anything containing sour cream. The following recipe includes buttermilk which always accounts for more moistness. Other than the buttermilk, it is pretty much a basic recipe like most others. For some reason, this recipe turns out much lighter in color than the other recipes but still has a delicious flavor. Preheat oven to 350F degrees; grease loaf pan. Combine sifted flour, salt, baking soda and baking powder; sift again and set aside. Cream Crisco and sugar; add eggs and beat well. Add mashed bananas and beat well. With a spoon blend in flour mixture, nuts and buttermilk. When well blended spoon into prepared loaf pan and bake about 45 minutes or until pick comes out clean. The number one tip in arriving at the best banana bread recipe lies in the bananas. They must be ripe but not “rotting”. 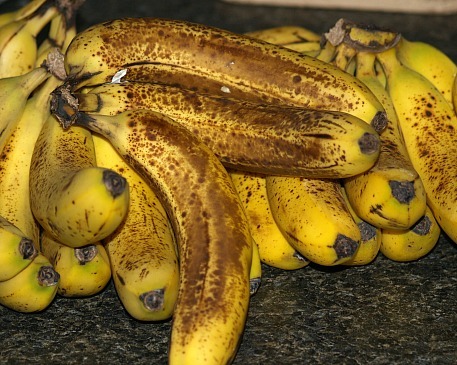 Ripeness will give the banana a very sweet “banana” taste; when “overly ripe” the bananas give a bad taste. So what did my taste test over two days of baking reveal to me? I cannot say that I prefer one recipe over the other; it is more of for what reason am I serving it. For instance, my recipe made with the All Bran Cereal is great for breakfast. It is very moist with a delicious banana flavor. Since it contains less sugar than most recipes, I would not hesitate serving it to my children for breakfast with a piece of breakfast meat and perhaps a slice of tomato. Try making this recipe in muffin cups! The recipe with chopped dates was a favorite when eating warm with butter. The dates had a stronger flavor while warm over eating cold. I was lucky to get the sour cream loaf in the oven; the batter tasted like banana pudding! After baking, this loaf was more moist like “bread pudding” than the other loaves. The banana blueberry was absolutely delicious! Like I said, it is hard to choose one as the “best banana bread recipe”. All are great and any one would be a hit if served to guests. If I had to choose ONE, I would have to select the BANANA NUT BREAD RECIPE at the top of this page made with the buttermilk. It is a little lighter in color and texture and has a wonderful banana flavor. It is a great “all-round” recipe to serve with anything and to serve any time of the day. When sliced on a tray or plate, it makes a very pretty presentation. Every Spanish country that I know of loves banana bread; they all claim to have the best banana bread recipe. Some are sweetened with sugar and some are sweetened with honey but most are not as sweet as most of our recipes here. Some of ours actually taste like cake! The Spanish recipes often include ingredients like cornmeal, wheat, soy and even yeast. They often serve the bread with honey and jams. Add mashed bananas, lemon juice and egg to creamed mixture beating until well blended. Sift the flour, baking powder, salt and cinnamon and add to the creamed mixture. Pour batter into a greased loaf pan; bake for 1 hour or until pick comes out clean. Serve with honey or top with cream or ice cream. Soften yeast in warm water. Combine corn meal, wheat germ, potato flour and soy flour; add softened yeast in a bowl. In another bowl combine eggs, banana, honey and corn oil; beat until blended. Add the dry mixture to the egg mixture and mix well. Place mixture in a greased loaf pan; let rise for 1 hour. Preheat oven to 325F degrees; bake about 45 to 50 minutes. Preheat oven to 350F degrees; grease and flour 2 loaf pans (8X4 inch size). Beat butter and cream cheese on medium speed of mixer until creamy. Gradually add the sugar beating until light and fluffy. Add eggs one at a time beating just to blend after each addition. Combine flour with baking powder, soda and salt. Gradually add flour mixture to creamed mixture beating just to blend. Stir bananas, pecan and vanilla into batter; spoon evenly into prepared pans. Bake 1 hour or until pick inserted in middle comes out clean. NOTE: Cover lightly with foil last 15 minutes to prevent over browning. Cook bread in pans on rack for 10 minutes; remove from pans and cool 30 minutes before slicing. This is the best banana bread recipe to serve to guest with coffee or tea. Preheat oven to 325F degrees; grease and flour 2 loaf pans (8X4 inches). TO MAKE BREAD cream sugar and butter. Add remaining ingredients and mix just until well blended. Spoon batter evenly into prepared pans; bake 45 to 60 minutes until pick comes out clean. TO MAKE FILLING whip together ingredients until smooth and creamy. TO ASSEMBLE slice cold bread thinly; spread filling between 2 slices. Cut sandwiches into finger sizes and serve.